Exclusive apartment (3 rooms, 85 sq m) in a quiet location, only 50m to the beach! 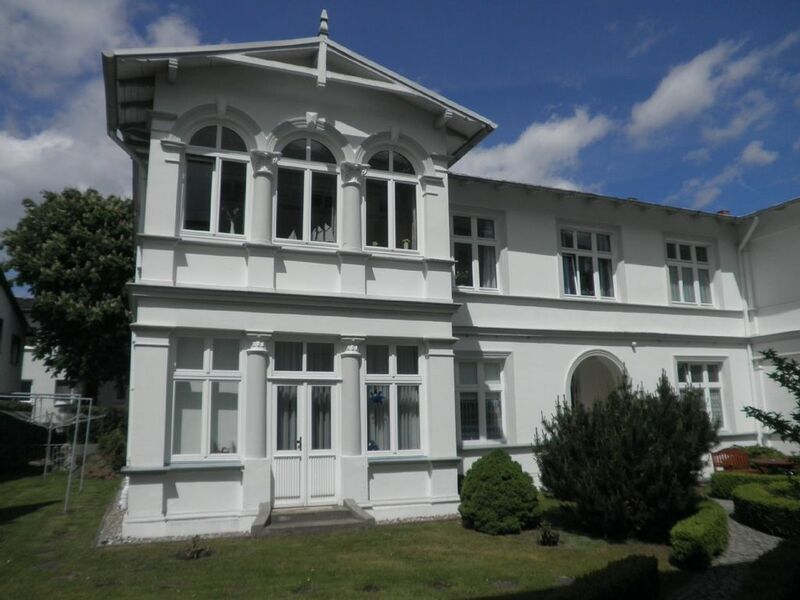 The Villa Elisabeth in the seaside resort of Heringsdorf was built in the imperial era in the beautiful style of the resort architecture and consists of an ensemble of two buildings, the front building and the garden shed. Both listed buildings have been extensively restored. Our spacious and tastefully furnished apartment has been extensively renovated by us recently and is located on the first floor of the garden house with a total of only four residential units. It consists of a large living room with loggia, two separate bedrooms, kitchen and bathroom with window and separate guest toilet. All rooms have flat screen TV, in the living room with 107cm screen diagonal. The kitchen is complete with built-in stove (four plates), dishwasher, microwave, coffee maker, toaster, kettle and of course glasses, crockery and cutlery. An initial supply of towels and bed linen are free. Also two parking spaces are already included in the rental price. Only 50m to the beach. Please also take a look at our beautiful apartments in the Villa Seestrasse (ad number 504681) and in the castle Hohenzollern (ad number 2034663). Eine tolle Wohnung, wenn nicht das 2. WC gewesen wäre. Das war eine Zumutung und müsste ausgetauscht werden. Ein Foto wäre zu unappetitlich! Es ist eine wunderschöne Wohnung. Man fühlt sich, als ob man nach Hause kommt. Jederzeit gerne wieder. Wir haben uns sehr wohl gefühlt. In diese Wohnung würden wir jederzeit wieder fahren. Grosszügig, hell, ruhig und wirklich alles da was man braucht. Das Wohnzimmer ist riesig und gemütlich mit komfortabler Ledergarnitur. Die Küche ist ebenfalls super und die beiden Schlafzimmer sind grosszügig genug um sich dort nicht eingeengt zu fühlen. An dieser Stelle ein kleiner Tip an den Eigentümer: Die Vorhänge in den Schlafzimmern sind schön aber für ein Schlafzimmer in dem viele es zur Nacht gerne dunkel haben nicht geeignet da sie nicht nicht abdunkeln. Ansonsten wäre noch zu sagen das der Kontakt mit Herrn Hoffmann sehr zuvorkommend und freundlich war. Auch das Verwalterehepaar welches sich vor Ort um die Wohnung kümmert war super freundlich und für Fragen jederzeit ansprechbar. Sie haben uns am Abreisetag sogar zum Bahnhof gefahren. Diese Wohnung ist also ein echtes Wohlfühlpaket. The villa is located in one of the most beautiful locations in the lake - and spa Heringsdorf on the island of Usedom, in the middle between the two piers of Heringsdorf and Ahlbeck. The environment is absolutely quiet. By the beach you can hear the waves rustling with the windows open. It is only a few steps to the sandy beach and the famous and lively lake promenade with many elaborately renovated villas. The beautiful and romantic promenade invites you to stroll or bike ride, as it reaches from Bansin via Heringsdorf to Ahlbeck. In the immediate vicinity are all imaginable shops and restaurants. The Ostseehotel Upstalsboom with its usable wellness and beauty area is located in the immediate vicinity. Heringsdorf is embedded in an impressive beech and mixed forest, the hinterland offers unforgettable views of the bay, many romantic lakes, fishing villages, castles and churches. Die ortsübliche Kurabgabe pro Person/Tag ist bitte vor Ort in der Tourismusinformation zu entrichten. Bitte sehen Sie sich auch unsere wunderschönen Wohnungen in der Villa Seestrasse (Inseratsnummer 504681), im Schloss Hohenzollern (Inseratsnummer 2034663) und unsere Ferienwohnung Inselstrand (Inseratsnummer 2190390) an.